Another prominent critic of President Donald Trump has joined the dozen-plus Democrats who want to challenge him in 2020. Terry McSweeney reports. Another prominent critic of President Donald Trump has joined the dozen-plus Democrats who want to challenge him in 2020. 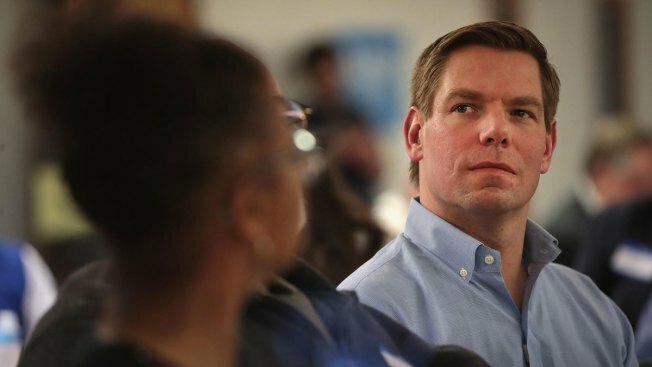 East Bay Rep. Eric Swalwell officially declared his bid for the 2020 presidential race Monday evening in an appearance on "The Late Show with Stephen Colbert" after much speculation and visits to Iowa, New Hampshire, Nevada and other states in the months leading up to the announcement. The 38-year-old Democratic congressman who represents California’s 15th Congressional District said in a clip that was released by the show: "I see a country in quicksand, unable to solve problems and threats from abroad, unable to make life better for people here at home. Nothing gets done. I'm ready to solve these problems. I'm running for president of the United States." "It's official," he added to cheers from the audience. "Boy did it feel good to say that." The Late Show released the clip on Twitter. The 38-year-old Iowa native was elected in 2012 to represent California’s 15th Congressional District. Swalwell joins what is expected to be a wide-open race for the Democratic presidential nomination. There's no apparent front-runner at this early stage, and he will face off against several of his Senate colleagues who have more name recognition. The race for the 2020 presidential election is underway, and the field of Democratic candidates is already packed and still growing. Those who have filed paperwork or announced presidential bids include a vice president, senators, House members and, so far, at least two mayors. As for the GOP, a single Republican has announced his bid to challenge President Donald Trump for the party nomination: former Massachusetts Gov. Bill Weld, who ran for vice president (and lost) in 2016 on the Libertarian party ticket.